Watch-ID.com is a comprehensive guide to watches worn by celebrities and spotted in the movies. Stay up to date with the latest sightings, news, and articles about watches in film fashion. Cool site to find out which watches are worn in movies. OceanicTime - Dedicated to dive watch; aficionados, connoisseurs, enthusiasts and novices alike. Get the latest industry news; spy shots, sneak peeks, articles, interviews and reviews plus every dive watch link you ever wanted all stylish packaged in one site . .
WATCH RADAR - Showcasing the watch world, but with a distinct difference. Watch Radar focuses not only the big name brands but also the lesser known niche watchmakers and newer startups. The Toughest and Most Tactical Watches - When it comes to tough and tactical watches, what’re your options?. Here you will find the toughest and most tactical watches in the world. 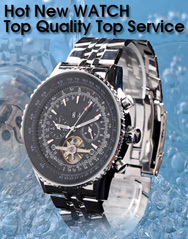 With watch reviews , news, useful information, tips and watch buying guides.